Tomorrow, when Marco Rubio and Mitt Romney appear together at the U.S. Chamber of Commerce, it will be sure to stir up speculation about the possibility that the Florida Senator will wind up as Romney’s VP nominee. In my estimation, that’s a red herring: In my new piece on Rubio and his friendship with U.S. Congressman David Rivera—who was recently named one of the most corrupt members of Congress—I question whether Rubio could possibly pass vetting for a VP nomination. But it’s worth pointing out that tomorrow’s appearance will highlight why Rubio is considered by Republican insiders to be an attractive potential nominee. Romney and Rubio will be the headline speakers at the annual summit of the Latino Coalition—a non-profit focused on the economic development of American Latinos. With the Latino vote of particular importance in this Presidential election, many Republicans are hoping that the young, charismatic Latino Senator from Florida can improve Romney’s changes with the demographic group. Conventional wisdom is that Republicans need to secure 40 percent of the Latino vote, the same number President Bush won in 2004, to win the presidential election. McCain carried roughly 30 percent in 2008, which was considered a significant failure. But right now, it looks as if Romney might do even worse than McCain. In a recent Pew Hispanic Center report in December, a survey of Latino registered voters found that Romney could win only 23 percent of the Hispanic vote, compared to Obama’s 68 percent. If Romney has a prayer of winning in November, he must improve his standing within the Latino community. That may be particularly difficult for Romney because of the way he tacked to the right on immigration issues during the primary, running a series of negative advertisements about immigration. Romney’s stance on the issue was recently criticized by fellow Republican, New Mexico Governor, Susana Martinez. 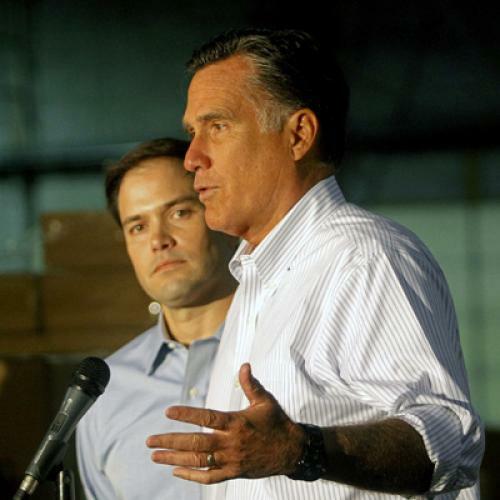 So could Rubio’s support make a difference for Romney? Probably not. As my TNR colleague Jon Cohn has written, while Rubio had a more moderate immigration approach during his tenure as a Florida state legislator, he moved to the right when he ran for Senate, opposing the DREAM Act (a bill that would offer a path to citizenship for undocumented young people who came to this country as children and who serve in the military or go to college.) Now Rubio has introduced a watered down version of the DREAM Act (which offers legal residency instead of citizenship), in an attempt to get on the better side of the issue. But Rubio’s refrain tomorrow, like Romney’s, will likely be that the GOP vision for a “free enterprise system” is the best thing for the Latino community’s economic success. Indeed, Republicans often point to the statistic that the number one issue for Latino voters is the economy, not immigration policy. But Republicans' harsh anti-immigration rhetoric alienates the community nonetheless. It’s unlikely that tomorrow’s speech, or many more like it, would make up for the damage already done.